LED Wholesalers has been in business since 2005 and has worked towards the goal of supplying long lasting energy efficient LED technology for its customers. Corporate headquarters is located in the USA in Hayward, California. LED Wholesalers is a company that does business worldwide with the underlying goal of offering the best performing LED technology at reasonable prices. The company hopes to support business through unparalleled customer service, superb product quality, and positive relationships. According to LED Wholesalers, the company has spent countless hours researching and developing products and has developed products with unique features specific to the LED Wholesalers brand. The LED Wholesalers brand label is what makes the 90 watt UFO LED grow light that the company produces unique. This company offers trademarked products and the 90 watt UFO LED grow light is one trademarked product being offered as a lighting solution for indoor growers. Please utilize the rest of this comprehensive LED grow light review to find the best LED grow light that fits your needs. The UFO LED grow light from LED Wholesalers offers 90 watts of power and the unit contains 90 x 1 watt LEDs that are manufactured by Bridgelux. The unit is a quad band LED grow light which means that it offers light wavelengths covering several ranges. The range includes red, blue, orange and white light. These light wavelengths are included at varying proportions based on research that reveals what type of light plants need most during various stages of development. 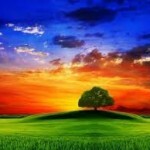 The optimized spectrum enhances chlorophyll/carotenes/xanthophylls absorption. 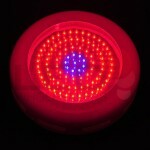 More specifically, the quad band of LEDs integrated into the 90 watt UFO includes 70 Red, 10 Blue, 5 Orange, and 5 White LEDs. The 90 watt UFO from LED Wholesalers does not produce infrared rays or ultraviolet radiation. According to LED Wholesalers, the Infrared and Ultraviolet light has been shown in some cases to stunt some plant growth. Additionally, the light emitted is focused by an integrated reflector to optimize the light output. The LEDs are wide angle and focus light at the 120 degree angle to enhance the product’s light coverage. Although LEDs are energy efficient and produce little heat, the 90 watt UFO from LED Wholesalers contain built-in fans to maintain a cooler running temperature. The unit is also ballast free and is relatively easy to hang. I was able to hang my LED grow light in very little time and it was relatively painless. LED Wholesalers identifies Bridgelux as the primary manufacturer of the LEDs utilized in the LED Wholesalers grow light products. Bridgelux has been in the business of manufacturing LED chips since 2004 and therefore has over ten years of experience developing technology. The company has designed eleven generations of LED chips with the aim of refining and improving the technology with each generation. Bridgelux has introduced many new technological revisions over the last five years which enables the company to stay relevant and up-to-date with the current research and innovations. Bridgelux is utilized by many other LED grow light companies and is considered a primary manufacturer of LED chip technology. The fact that LED Wholesalers utilizes LED chips designed and developed by Bridgelux can be considered a plus. The 90W UFO LED grow light from LED Wholesalers is quad band and emits light in the red, orange, blue, and white ranges. Photosynthetically active radiation, abbreviated PAR, is the special spectral range of solar radiation (wave bands) that plants’ utilize most during their grow process. Many research studies reveal that the wavelengths between 400 and 700 nanometers act as a primary catalyst of the process of photosynthesis in plants. Plant pigments such as Chlorophyll, carotenes and xanthophylls harvest the light in the PAR range to support plant growth. The 90W UFO from LED Wholesalers incorporates this “light recipe.” The specific wavelengths include 660 nm RED, 450 nm Blue and 615 nm Orange. Light wavelengths in the blue range maximizes photosynthesis while promoting vegetative growth during the plant’s grow process. Light in the red and orange range help to support flowering during the plant’s grow process. Studies show that blue light mixed with red light can produce a higher plant biomass. Orange lights has specifically been shown to keep pests down, which may not be a significant concern for indoor grow scenarios, and red light can specifically help to maximize chlorophyll absorption from germination to flower bud. Most LEDs do not emit light in all directions. The beam angle listed for this product is 120 degrees. This beam angle is wider than others and will spread the light emitted from the grow light more broadly. Proper beam angle can assure that light intensity is sufficient to support a specific plant grow objective. Keep in mind that beam angle becomes a little less important when a grower is growing inside of a grow tent or grow closet. If you plant on growing inside of a grow tent, you should be able to enhance the light penetration into the plant. Keep in mind that the greater the beam angle, the faster the light emitted disperses or spreads out. Beam angle can have a direct impact on plant development due to the intensity factor. For more information on beam angle, read my home post here. The unit is a quad band and emits the light wavelengths that research shows are very effective at promoting healthy plant development. Emits Red, Blue, Orange and White light to encourage vegetative growth and flowering. The unit is relatively inexpensive when compared to other LED grow lights on the market today. Unit is energy efficient and LEDs can be up to 80 percent more energy efficient that other Metal Halide & HPS grow lights. White LEDs provide light wavelengths that will cover missing spectrum the plants need to develop properly. 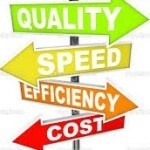 LED Wholesalers does offer a warranty, but keep in mind that the warranty is for 1 full year from the purchase date. The unit is only 90 watts of power which is in the lower tier of power output for units on the current market. On the plus side though, it uses less energy and so the unit costs less to run. The listed price is generally one of the lower listed prices available for an LED grow light. It should also be noted that there are very few reviews available on this product. On one side, few negative reviews are out there on this product, but a lack of overall review numbers could also reveal factors associated with product popularity. 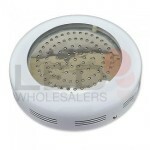 In general, LED Wholesalers provides a 1 year warranty on most of its products. 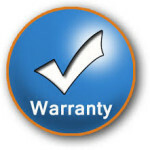 The offered warranty is a 365 day warranty from the purchase date of the product. 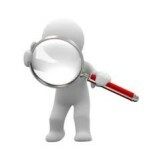 Given a returned product, LED Wholesalers will inspect the product and either repair or replace the product. The shipping charges are non-refundable. It should be noted that the 1 year warranty provided by LED Wholesalers is better than no warranty at all, but falls below the 2 and 3 year warranty options offered by other major LED grow light companies. Some growers contend that 90 watts of power is not very suitable for growing multiple plants that need a wide and intense footprint of light during development. Growers should keep in mind though that LEDs are more efficient at giving plants the right “recipe” of light that optimizes growth and healthy development. I would recommend that a grower utilize this LED grow light to focus in on one plant or to support the development of several small plants. Keep in mind that most LED grow light companies will work with you to help evaluate your needs and help you to create a plan that highlights the number, and type, of LED grow light units that will be needed in order to optimize growing outcomes. Please be sure to contact an associate with the company for this type of analysis that is generally done at no cost to the consumer. The 90 watt UFO LED grow light from LED Wholesalers is a unit used by indoor growers because it is efficient and includes blue, red, orange, and white light. It uses a wide angle lens to enhance light coverage area and the type of light emitted is the type that can be most beneficial for plants. The 90 watt UFO is not a commercial type of grow light and at 90 watts of power, it is best suited for a relatively small area of plants in close proximity. Now it is time for you to decide if the 90 watt LED grow light from LED Wholesalers can help you grow big at home. My sincere hope is that this LED grow light review is useful and supports you in your search for the best LED grow light on the market.